How many college girls cleaned cathouses?I was watching a show on t.v. today and heard the over-used phrase You can't have your cake and eat it too, to which I replied, "Why not?" When in the history of ever has someone had the dilemma of being given a piece of cake which they weren't allowed to eat (dietetic reasons don't count)? Why would you ever want to have a piece of cake if you couldn't eat it? I have to go with Marie Antoinette and her stance of letting people eat cake...or not, as it turns out that she didn't really say this.What does my book review have to do with cake, you ask? New Orleans was the cake that I wanted to eat but never got to. Out of the Easy should have delivered on the promise of New Orleans. A few mentions of brick dust (it's a voodoo thing), Mardi Gras, and dropping the names of famous streets, struggled to fully cement the atmosphere of life at a brothel in the Big Easy during the mid-twentieth century. I longed to be a part of the surroundings and never quite felt like I made it there in full capacity.Since this wasn't a setting-driven book, we're left to look at the styles of story-driven and character-driven. I would consider Out of the Easy to be a little bit of both, but if I had to pick a stronger point, I'd be likely to fall on the character-driven side. The cast of characters were an eclectic bunch. From the snappy madam to the kindly driver, each person had a certain quality which made them unique. "You're named after a madam. I'm named after a murderer. Mine's worse. "There were offbeat characters. There was a murder mystery. There were the obstacles of prejudice to overcome. There was the the tale of a woman coming-of-age, and how she had to learn to make her own way in the world, outside of her mother's stigma as a prostitute.I first fell in love with Ruta Sepetys' writing with her now well-known book [b:Between Shades of Gray|7824322|Between Shades of Gray|Ruta Sepetys|http://d202m5krfqbpi5.cloudfront.net/books/1327873479s/7824322.jpg|10870318], which was absolutely brilliant and showcased the passion that one writer could have in wanting to bring a hidden story to life (she went on her own pilgrimage to find out the history of her people in order to write the book). Even though I appreciated and enjoyed Sepetys' effort with Out of the Easy, I think I mentally set the bar high in hoping that this book would equal my strong feelings for BSOG. While I found Out of the Easy an engaging read, I don't know if I ever fully attached to the story in the way I would have liked to.Even so, I still have so much love for her style of writing. I'm pretty sure that I'd read anything this author put out there. She has this way of drawing you in through beautiful prose and small hints of things to come. 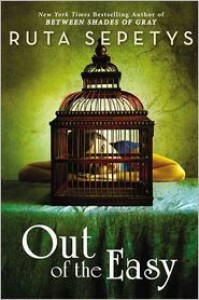 With both of her books, there was an underlying message of holding on to hope. The reader wants to hope for more for these characters.Jo wanted to get Out of the Easy. I wanted her to get out as well. This is why I kept reading, to see if she could make her dreams reality. I still don't know if I want to go 3 or 4 on the rating. If it changes, my apologies.